A very elegant designer maxi dress from Koh Koh. This beautiful short sleeve maxi dress features batwing or dolman sleeves, a crossover chest and a pleated empire waist skirt which provides the design with a lovely flow when walking. In addition, the design has an elastic waist which will ensure that this design is a wonderful fit for all body shapes. This super versatile maxi dress design makes for the perfect all-rounder, it can be worn as a cocktail dress, evening dress, formal dress, or even as a maternity dress or pregnancy maxi for those expectant mothers. 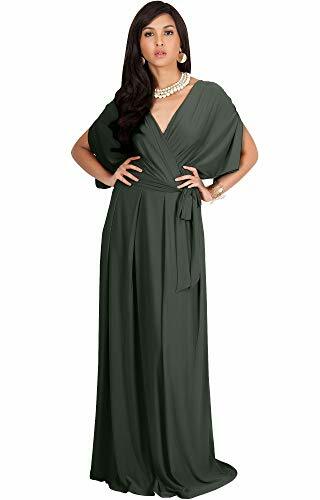 The design is an understated glam design, perfect for wedding party dresses, bridesmaid dress, mother of the bride dress and mother of the groom dress. Many ladies have used the white of ivory color as a wedding dress. The color is Olive Green and size Large / L / 12-14.